it is good to avoid spurious talk of ‘normalizing monetary policy’ when we are living in a paradigm of wage stagnation, precarious employment, household indebtedness, rising inequality, and job losses from off shoring and technological change. 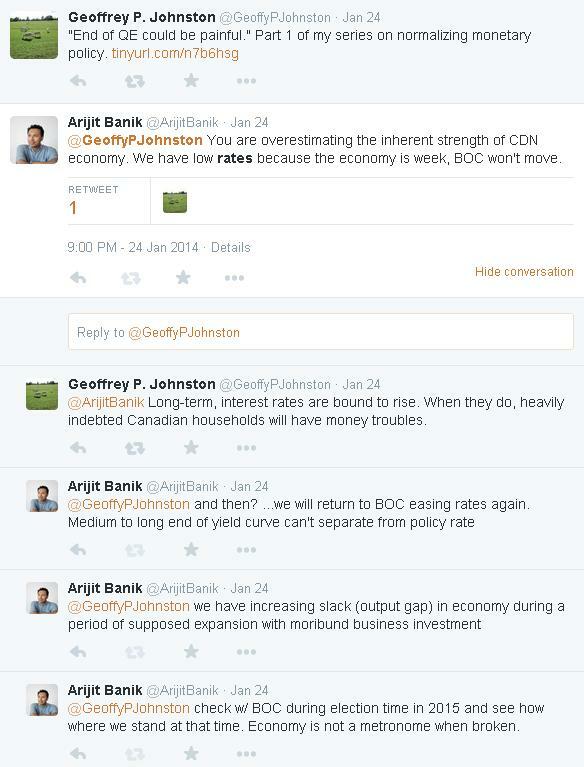 Monetary policy is supposed to be the elixir to fix this? 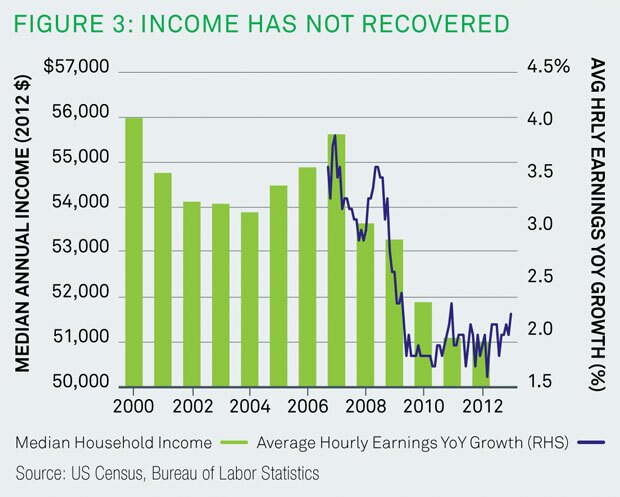 If Income has not recovered will the ‘recovery’ recover? Figure 3 highlights the longer term measurement of median family income from the census bureau updated to the end of 2012. Incomes have continued to fall since the onset of the crisis. Figure 3 also highlights the latest figures on income growth from the monthly employment situation report. This captures monthly wage trends and similarly highlights the collapse in income growth following the crisis. That lack of income growing faster than prices are going up holds back consumers ability to spend. Rosenberg’s point of income as a key to growth –I won’t refer to it as sustainable growth– hints that the United States recovery is demand constrained. Stagnant income absent access to credit entails depressed consumption as those in the upper percentile have little reason to spend hence no flow of funds trickling down. In addition, in the case of the masses one has to believe that in a cycle of household deleveraging and bank balance sheet repair that access to credit will not return unless it is extended by banks and non bank financials to the same households that embraced it over the past generation in order to maintain consumption –conspicuous or otherwise. Think of the analogy of banks: they can survive for a long time if they are insolvent but will dissolve if illiquid hence the emphasis on liquidity coverage ratios (LCR) in the Basel III framework. This analogy holds true for households. When Minsky wrote that capitalism is essentially a financial system, it was before the advent of modern finance, before financial deregulation and the mutual fund revolution, before the breakdown of Bretton Woods and the subsequent rise of global currency markets, before the Eurodollar market, before junk bonds, and before securitization. He was writing, in fact, before practically all the developments that have rendered his statement merely a truism now at the end of the twentieth century, which is not to suggest that he ahead to what would happen, since he didn’t. When he wrote that capitalism is essentially a financial system, he was referring to the capitalism of his own time, a capitalism that, by modern standards, was remarkably undeveloped financially. What then does he mean by “essentially financial”? Minsky means that in a capitalist economy every economic unit — every firm, household, government, even every nation — is, in essential respects, like a bank facing the problem of daily balancing cash inflow against cash outflow. For him, the key problem an economic unit faces is not the familiar economists’s problem of maximizing profit or utility subject to a budget constraint. More fundamental is the problem posed by the “survival constraint” that requires that cash outflow not exceed cash inflow. To meet this constraint minute by minute, day by day, week in and week out, requires individual agents continually to have in mind the balance between their cash commitments and their cash flows, but it requires more than that. Because cash flows inevitably fall short from time to time, individuals require access to a reliable source of refinance that allows them to meet current cash flow needs by pledging expected future cash flows. To read Mehrling’s full paper go here. The takeaway entails a lack of economic stability and growth; my personal bias also sees the underlying fault line in our economic system entailing a lack of resilience. We are a long way from Adam Smith’s ideal of perfect competition under conditions of perfect liberty; that world does not exist. Mehrling  is The Money Interest and the Public Interest: American Monetary Thought, 1920-1970. Cambridge: Harvard University Press, 1997. Rosenberg, Jeff. BlackRock, “Fool Me Once.” Last modified October 03, 2013. Accessed October 24, 2013. https://www2.blackrock.com/us/financial-professionals/market-insight/fixed-income-monthly. Perry Mehrling, “Minsky and Modern Finance: The case of Long Term Capital Management,” The Journal of Portfolio Management, 26, no. 2 (2000): (81-88), http://economics.barnard.edu/sites/default/files/inline/minsky_and_modern_finance.pdf (accessed October 24, 2013).